Any bird owner will know that their pets are happier (and healthier) when they have more space. After maxing out the size of your bird cage, you might decide to upgrade to an indoor aviary. Or, if you have the right climate and backyard space then an outdoor aviary is also an option. An indoor aviary simply provides your birds with more room to fly, exercise and stretch their wings. With the extra space provided from the aviary, you can also give your birds more plants, toys, perches and ropes to play with. Some aviaries even allow you to walk inside with your birds. Protected from the weather – If you house your birds indoors then they’ll be much more protected from temperature extremes. So when there’s a scorching desert sun or the brutally cold snow, they be protected when located indoors. This is especially true if you live in areas that experience hurricanes or windy storms (see our guide to looking after your bird during these here). No chance for predators – When you have an outdoor aviary you need to think about predators such as foxes, raccoons, hawks and more. Now unless those predators can figure out a way to break into your home then your birds are going to be very safe from them. Also, although thefts are uncommon in outdoor aviaries, they’re even less likely to occur with an indoor bird aviary. Birds are happier and healthier – Compared with bird cages, there is simply more room for a bird to fly, exercise, play and interact. This all improves a birds quality of life. More interaction – According to BirdsnWays.com, when your birds are located inside your home you’re simply more likely to play and enjoy them than if they’re located outside. What’s more, enjoying your birds is one of the main reasons to get into bird keeping in the first place, so having an indoor aviary just makes sense. If you close the doors and windows in the house, you can introduce your birds to your entire home. Afterwards, you can still return your birds into their indoor aviary so they don’t have free rein all day long to chew up your home! Escapes are unlikely – Birds that live inside an indoor aviary not only have to escape from the aviary itself but then also have to figure a way of getting out of the house as well. So as long as your windows and doors are closed, your bird is unlikely to ever escape. 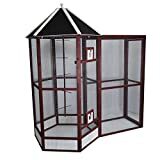 Aviaries by their nature are quite large and so you should measure the dimensions within your room and then compare this with the size of the aviary you are going to buy. This is particulary true if you’re buying an aviary with a slanted roof that can be used outdoors as well as indoors. The design of the aviary affects how easy it is to clean, maintain and then gain access to your birds. 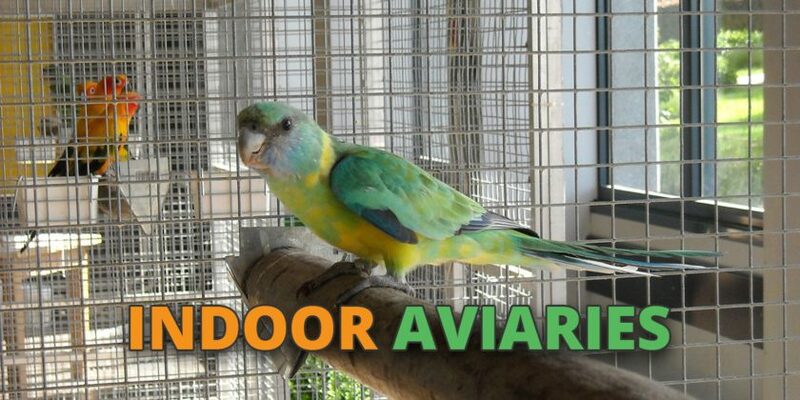 Aviaries with large access doors will make taking your bird in and out of the cage much easier. You also want to look out for small access side doors that are next to the feeding and watering stations so you can top them up without opening the main door. Removable trays are also a key feature that will make cleaning the aviary a lot easier (though these don’t tend to be present on larger sized indoor aviaries). Sometimes you even get access doors for breeding boxes that can be installed high up on the sides of an aviary. The set up for most indoor aviaries is fairly straightforward, although some of the larger options are easier to install when you’ve got another person to help. Also, normally all of the tools needed to fasten together the bolts on the aviary are usually included. However, you may need a screwdriver or spanner to fix any nuts and bolts. Some birds will chew and damage your aviary whereas others will not. For example, with a finch aviary you don’t need to worry about finches chewing and breaking the bars but with a parrot aviary you do. Most importantly though, you just need the materials of the aviary to be bird safe. Pretty much all bird cages and aviaries are made from bird safe materials, however in the paragraph below I’ve made a quick run down of what to look for. The aviary bars are to be made from wrought iron with a powdered coat on top. The powder coating is very hard for birds beaks to chew off so you don’t need to worry about them consuming paint flakes. The wiring for cages is usually made from galvanized steel. This is generally safe if it is galvanized steel AFTER welding but is not as safe if it is galvanized steel BEFORE welding. Stainless steel cages are another option and are very high quality but also tend to be very expensive as well. The people over at Parrots.org always recommend wiping down any new aviaries down with a cloth and vinegar to get rid of lumps that might be present in the wire mesh. In terms of wooden materials, below is a list of bird safe wood that is fine for the aviary to be made out of. At a minimum, a cheap indoor aviary is likely to cost $100. 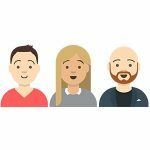 However, the average price range is more likely to be $150 to $350. Higher end indoor aviaries with more features, space and longevity are available in the $350 to $700 range. 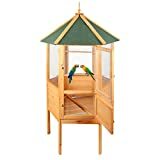 When budgeting for the cost of the aviary, you should also think about any accessories that you’re going to buy as well. Beautifully designed, this aviary is made from high quality indoor materials that make it’s appearance very stylish. Good for small birds such as finches and parakeets. Made from bird safe wood (CARB Phase II complaint). Large, front access door makes it easy for cleaning. Lack of wheels on the legs means the aviary is less mobile. Could do with extra access doors to make topping up the food easier. Construction materials could be better. Despite it’s minor flaws, this beautiful aviary looks great inside many homes. Although it’s large, assembly is easy. Hexagonal design provides plenty of space for toys and accessories. 2 large front doors and removable tray make it easy for cleaning. Large bottom wall panels act as seed guards. A few minor alignment issues during setup. This hexagonal shaped aviary is good for those looking for a non-traditional design. Large – The extra room provided by this aviary is great if you need to cater to a number of birds thus require more space. Walk-in – The design provides an escape proof doorway entrance. Easy to maintain – big enough for a human to enter so they cab clean up and top up the food/water. 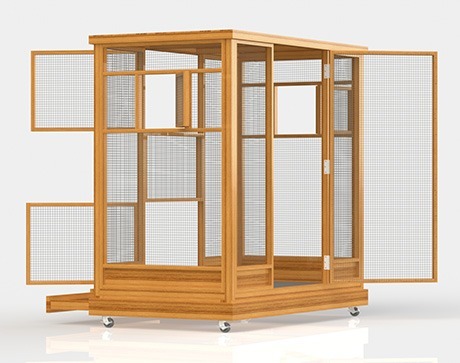 Durable materials – This aviary uses high quality wood that can withstand the weather so it can be used both as an indoor or outdoor aviary. Easy to assembly despite size, only takes an hour. Cypress Fir from sustainable forests (Advantek’s GoneGreen initiative) which is insect/rot resistant. Lack of floor tray means this should only be used on hard flooring. Could do with stronger wire mesh. If you have the space and budget for this aviary, then this is the best overall option. Extra space of the aviary provides plenty of room for your birds. Internal tray and perches can be used to host accessories. High quality fir wood is used, which a durable and animal friendly timber. The addition of the hatching box is a nice bonus. Picture based instructions are easy to follow. Wire mesh could be better. Not for birds that are known chewers because they will get through the wood. This indoor aviary provides plenty of room and is ideal for smaller birds such as finches and budgies. Closely packed wire mesh makes it ideal for smaller birds. More affordable than most aviaries. Caster wheels create mobility allowing you to move the flight aviary around your house. Made from a long lasting and durable metal. Ideal if you want a flight aviary cage that allows your birds to stretch their wings. 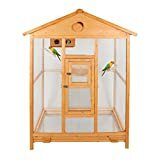 The room for the indoor bird aviary – You can keep an indoor aviary in most rooms of your house. Conservatories work particularly well as do spare bedrooms. The living or dining room are also possible if you have enough space in these locations. Kitchens should be avoided because of the fumes from cooking and you should always avoid cooking using teflon pans as these can be poisonous to your birds. Windows, lighting and fresh air – All of these are are needed for your birds. If you’re choosing a basement or garage to house your birds then you’ll need one that has plenty of sunlight and windows. Air filters to prevent dust and dander build up are also important. Feeding & Watering – Consider where the doors and feeding/watering stations are going to be located. These doors need to be easy to access and shouldn’t be blocked by furniture or other objects inside your home. Movability – Having wheels on the indoor aviary will make it much easier for you to clean it and change it’s location in the house. Flooring – Think about how you’re going to clean the floor and mess. You probably want to consider installing or buying some sort of tray, mat or removable floor (which is commonly needed if you’re moving an outdoor aviary into your house and the outdoor aviary has no floor). Additionally, you may want to place bird cage liners on the bottom of the aviary floor to make clean up easier. Acstiels.com recommends the installation of a non-porous floor if you have the ability and avoiding carpet because it is difficult to clean.